You’d be forgiven if you thought I was going to discuss the benefits of black & white photography or something to that effect. 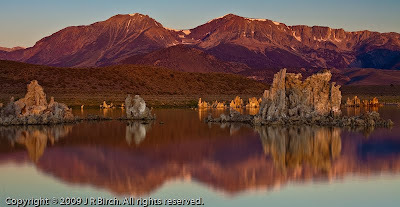 I’m referring of course, to Mono lake in California, one of the oldest lakes in North America. Mono Lake is located in the Mono basin, flanked to the north by the Bodie Hills, to the west by Sierra Nevada Mountain range, and to the east by Crowtack Mountain of Nevada, and adjacent to the town of Lee Vining almost 6,800 ft above sea level. The scenery is a stark contrast from the pine forests and alpine meadows of nearby Yosemite Valley 75 miles over the Tioga mountain pass, comprising a semi-arid, desert-like landscape, dominated by distinctive igneous geology with many volcanic craters. It is a lake that is not without controversy either. Back in 1941 the Los Angeles Department of Water and Power began water extraction which was to eventually exceeded inflow and as a result the lake level began to drop. By 1982 the lake surface area had been reduced by over 30 percent. This also began to expose submerged tufa towers; large limestone spires formed by calcium waters transported to lake bed by geothermal springs, reacting with the salt-rich lake waters and depositing layer-upon-layer of calcium carbonate over time. It also drastically effected the salinity of the lake, exposing salt rich deposits to erosion and now the lake is 2½ times more salty than the ocean. Not much can survive in that, and not much does (there are no fish), however the lake is home to Artemia monica, a tiny species of brine shrimp, no bigger than a thumbnail, that are entirely unique to Mono Lake. Local inhabitants formed the Mono Lake Committee in 1978 and many years of legal proceedings and representations followed which have eventually resulted in a directive to reduce water extraction and (hopefully) eventually return the lake to it’s former levels. However the battle still continues on. Mono Lake and the surrounding area provide a truly unique and interesting landscape but it is the tufa towers that provide great interest to photographers. I’d past through Lee Vining briefly back in 1984, but never visited the tufa areas, now designated as a California State Reserve Park. The Mono Basin Scenic Area Visitor Centre, just off Highway 395 to the north of Lee Vining, includes a variety of exhibits about the natural and human history of the Mono Basin and is a good place to research your photographic location if you have time beforehand. 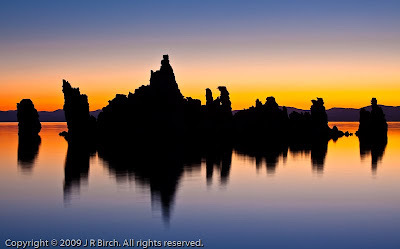 The best area for photographers is South Tufa, on the southern shoreline, where are tufa spires up to 30-ft high and ranging in age from 200-700 years old are exposed, providing a surreal landscape. I didn’t have the luxury of a reconnaissance trip before my dawn shoot, so it was up at 4:30 am and a drive out in the dark for me during my summer 2009 visit. As I drove out from Lee Vining and turned onto highway-120, there was a beautiful pre-dawn red glow reflected in the lake that made it seem like it was on fire and I began to wonder if my 4:30am alarm call had been early enough. There were other cars in the car park too, so I set off briskly down the wooded walkway in the dim, pre-dawn light with my head torch lighting the way. It’s quite strange visiting a location for the first time in the dark (not the best thing to do), but I didn’t have the opportunity to explore the day before and I could just about make out the shadows of the eerie tufa spires all around. I found three other photographers with tripods already set-up at the beach at the end of the boardwalk, so I set up beside them and began to chat. Luckily for me one turned out to be Ralph Nortstom, a delightful chap, and professional photographer conducting a small workshop. Ralph was kind enough to give me some pointers and shortly I was snapping away with the rest of them. You can smell the salt at Mono lake and as it got lighter I became aware of the millions of lake flies floating on the water and along the shore line which ripple away in vast waves as you walk towards them. Thankfully they don’t bother or bite. As the light gradually increased I became aware of many other photographers arriving and others scattered amongst the tufas. I must have counted over 30, so this is definitely a very popular spot. I went for a walk eastwards through the large shore bound accumulation of tufas and tried several other spots, but soon the good light had gone, but I found exactly the right location for my shot for the following day. The next morning I was first to arrive, but the pre-dawn glow didn’t seem anywhere near as intense as the day before. The sky was cloudless again too. It was so much easier to find my location this time; it certainly pays to investigate your location beforehand if you can. I had envisaged catching silhouettes and shadowy reflections of a tufa island just offshore looking eastward into a red dawn glow. Despite the lack of brilliance, stopping down increases the saturation and as the light increased I used graduated ND filters to hold back the sky and balance it with the reflections within the lake. I also tried additional ND filters to lengthen my exposure time to smooth out the surface of the lake, an effect I quite like. Soon the golden light had faded and I tried other shots. There are so many unusual shapes within the tufa you can spend ages here. It’s a wonderful spot and I was really pleased with my shot. I hope you agree. Head south from Lee Vining on US-395 for approximately 5½ miles. Get into the left hand lane and take a sharp left onto Hwy-120, which is signposted Benton 46 and Mono Lake South Tufa 5 miles. After a further 4.7 miles you’ll see a sign to Mono Lake South Tufa. Make a left onto Test Station Road, just where Hwy-120 turns begins to turn sharply to the right. The road is paved but not for long. Take the left hand road where the road forks; the right goes to Navy Beach. This is the end of the paved section but the gravel track down to the car park is fine for most vehicles. From the car park it’s a 5 minute walk down a boardwalk to the beach. The end of this path is a good location, but better locations can be had by heading off to the right (eastwards) and following one of the several paths through the large tufas to the beach beyond where your will be able to photographs tufas offshore silhouetted into the dawn or rising sun. Bodie State Park – quite probably the best ghost town of all. John, excellent article and beautiful photographs. They all have a wonderful mood while each having something individualistic to say. Looking at some of your other photographs, you beautifully captured some of the prime location in the American Southwest. Let me know if you ever head back this way.